PEDORTHICS (n): the design, manufacture, modification and fit of footwear and orthoses to help deal with pain, discomfort and disabilities in the legs and feet. If you, or a member of your family are dealing with foot pain, are suffering from a disease process which can affect your feet, circulation or sensation, or have noticed an abnormal wear pattern to your footwear, you may want to visit your local Pedorthic Practitioner. They may be able to help you deal with your foot and lower limb discomfort. Certified Pedorthists are trained to deal with these and many more complicated situations of the human foot. 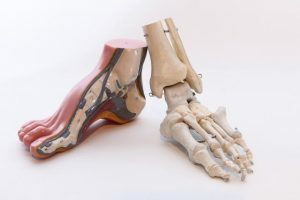 In many cases, internal or external modifications may be indicated to treat these deformities, and can come in the form of sole lifts, rocker soles, balloon patches, and changes to the profile of a shoe’s upper. A custom made foot orthosis (Orthotic) may also be required to deal with specific biomechanical (movement) problems, pressure distribution, or impact. Your Pedorthic Practitioner is qualified to treat these and many other conditions of the foot and lower leg.